Provides operators with a more comfortable ride on uneven surfaces. 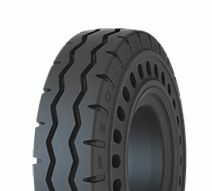 A solid tyre with a unique aperture design prevents shock transfer to fragile or impact-sensitive loads. DAMAGE RESILIENT+ PERFORMANCE + ENERGY SAVINGS.